Reading Toronto-based artist Ron Hotz’s 2018 book Artsy Fartsy Cry Baby has left me with many unanswerable questions. To wit: Can you map the creative process? For whom do artists create? What exactly is the nature of and the responsibilities inherent in the relationship between an artist and their art? When a creator has no confidence in what they create, is what they create still art? If an artist tells you that what they have created is a narrative, is that enough for there to be a story? I could go on. But this is a review, right? I mean, I’m telling you it is, so, therefore, it becomes one. Yes? The very nature of a review means that I should be the one doing the work, though -- the “reviewing” as it were -- instead of putting the onus on you, the reader. You’ve come here looking for direction, purpose, hoping that I will tell you about the merits of that which I am purporting to review. 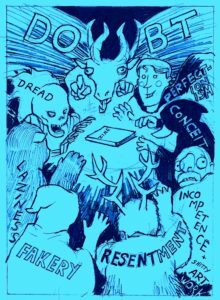 Criticism is, at its heart, a statement of the critic’s sense of how a particular thing either meets or fails to meet a certain set of criteria that the critic believes to have value. The reader is supposed to take in the statements of the critic and then judge for themselves whether or not the critic has done an adequate job of convincing them of the particular stance vis a vis the merits of the work at the center of the work of criticism. Starting reviews with questions undercuts that relationship from the get-go. Questions admit uncertainty, it points to the fact that aspects of thinking are left unresolved. Does a critic lose credibility by revealing to the reader that their authority only goes so far? Does this undermine any authority the work of criticism claims to carry? Artsy Fartsy Cry Baby is a question in and of itself. Is it one book or two? Is the first half of the book the process of creating the second half, a story about the search for a story? 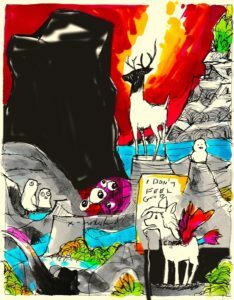 Is it the prejudice Hotz expresses towards his own art that gives him the creative push he needed to create the book itself? Is this, as Hotz suggests “style without content … [using] word bubbles to fill up space”? 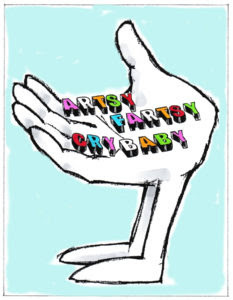 And, if so, why is the second part of Artsy Fartsy Cry Baby entirely wordless? Is the unifying theme of the whole thing just that it IS a whole thing because Hotz has bound it all together and therefore the form dictates its function? Answers are hard to come by. 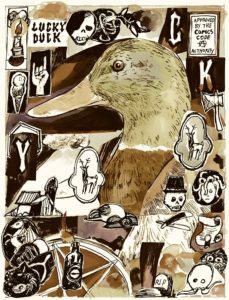 Remember in 2012 when Keith Silva wrote an entire review of The Bulletproof Coffin: Disinterred #4 all in questions? That made sense, right? I mean, the questions there WERE the answers. Weren’t they? And it wouldn’t be right if I didn’t interrogate Artsy Fartsy Cry Baby itself. Isn’t that what criticism does? I’ve got to ask: is this even comics? It’s certainly not traditional comics -- there’s no panels or closure. The art and dialogue aren’t working in harmony to convey action, time, or character. Rather, the text seems to be commenting on the art, as if Hotz is standing next to you as you flip through his portfolio talking about each piece as you turn the page. But there is continuity in both image and idea. There’s narrative. There’s an ending -- actually, there are two endings -- but is the first ending really the beginning of the second story, the one that ends on a note that strikes one as the beginning of something else? Hotz is taking his reader someplace interesting, though. The question (of course), is it a journey through the process of making art, the art itself, or the apperception of the art? On such a safari, who controls the narrative? Which story is being told? Who’s responsible for cutting back the jungle and how does anyone know when they’ve reached the destination? The second half of the book seems to suggest something other than the first half. Or does it? Is the arrival dependent upon who’s guiding us through? Can art itself dictate its own understanding? Can an artist unaware of purpose be counted on to find a way home? Can an audience lost in uncharted territory find its way out of the labyrinth? Who gets to answer these questions? More importantly, am I the one who should be asking them in the first place? Does this make ME, the critic writing this piece, the artsy fartsy crybaby in this scenario? Finally, a question I have an answer to. The answer is, of course, NO. It’s not me. It’s probably not even Ron Hotz.